Whether recording as a solo artist, performing as a member of E.M.P. 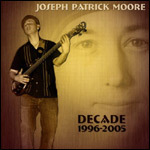 Project, or touring as a sideman, Joseph Patrick Moore has demonstrated the diversity of his musical prowess across a broad spectrum of musical genres while utilizing acoustic upright, electric, and fretless basses. Moore's fascination with music began at a young age. With encouragement from his family, Moore started playing alto saxophone at age eight before switching to drums and then later bass in high school. Following high school, Moore attended the University of Tennessee at Knoxville (UTK) on a full scholarship to pursue double and electric bass studies with a major in both classical and jazz performance. In order to experience more performance opportunities, Moore transferred to the University of Memphis after 2 1/2 years at UTK and eventually relocated to Atlanta in 1997 where he continues to reside today. Upon his arrival in Atlanta, Moore joined the Fiji Mariners which featured Col. Bruce Hampton. As a member of the Fiji Mariners, Moore played alongside a number of notable artists who would frequently sit in with the group. After his stint with the Fiji Mariners, Moore spent the next few years performing regularly in the Atlanta area and also on tours that spanned the United States. Consisting of drummer William Ellis, guitarist Shawn Perkinson, and Moore on bass, E.M.P. Project released their self-titled, debut recording as a trio in 2002. Their original repertoire merges the explorative sounds of traditional jazz with bop, latin, and contemporary jazz. 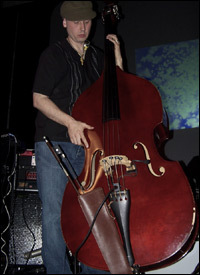 In 2003, Moore established the first "all digital," independent jazz recording label, Blue Canoe Records, and to share the experience he had acquired over the years as a musician, Moore joined the faculty of MusicDojo where he instructs students located around the world through his online music courses. 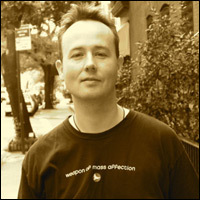 Since 1996, Moore has completed 5 projects as a solo artist and has appeared as a sideman on over 40 recordings by a variety of artists. In April, 2005, Moore recorded his first live CD, Live In 05. In this interview, Moore talks about his new recordings as a solo artist and a member of E.M.P. Project, Blue Canoe Records, doing remote sessions via the web, teaching online through MusicDojo, and the benefits of playing both electric and acoustic upright basses. In November, 2005, you released your first live CD, Live In 05, along with Wherever We Go, the second studio recording as a member of the trio known as E.M.P. Project. Can you tell us about these new CDs? The Live In 05 CD is actually part of the audio from a DVD concert that is yet to be released. I was blessed to be joined by Jon Chalden on drums, Al Smith on keys, Emrah Kotan on percussion, and Al Smith on EWI and bass EWI. Ten of the eleven tunes are mine, but most of these selections have been rearranged from the previous studio versions. As for the release of E.M.P. Project's Wherever We Go, we recorded this CD in Nashville a little over a year ago. It features William Ellis on drums and Shawn Perkins on guitar. These guys are monster players, and it is very challenging and fun for me to create music with them. By the way, E.M.P. is the initials of our last names Ellis, Moore, and Perkinson. On Wherever We Go, we each contributed tunes for the project. Like our first CD, we only rehearsed the tracks one or two times before the record button was pushed. Both of our CDs were recorded in this fashion, and each CD was finished in two days. How did E.M.P. Project come together? We all met at the University of Tennessee in Knoxville back in the early 1990's, and we all recognized that we had a strong sense of chemistry together. So after many years of not performing together, we decided to reunite a few years ago and record some material. We had such a good time on our first CD titled E.M.P. Project that we decided to do it again with Wherever We Go. Hopefully we will continue to record more CD projects in the future, and if our schedules line up, we'd like to perform a series of shows or tours. Viewers can read about the latest E.M.P.-related news on our website, EMPProject.net. Besides Live In 05, you have also released 4 other projects as a leader. What type of material is found on those recordings? I've recorded Never Never Land (1996), Soul Cloud (2000), a solo bass album in 2002 titled Alone Together, and Drum & Bass Society - Volume 1 (2004). Probably only half the songs from every CD really feature the bass in terms of solos or in-your-face-type playing. The other half of my playing on those recordings tends to be a more supportive and laid back role with the focus on the compositions. The tunes themselves tend to be a mixture of jazz, funk, jam, new age, and rearranged pop tunes. I have to admit that my material on each of these CDs does tend to be a little all over the place. However, I'm working on being more "unified" in the future. In fact, this "all-over-the-place" approach has, in my humble opinion, helped to define who I am. Until recently, I wasn't sure "who I was" or "what my sound was," but after all these years, I'm starting to figure that out, and I'm really excited about what I'm hearing. Where can viewers purchase your recordings? The obvious place would be my personal website, JosephPatrickMoore.com. However, you can also pick them up through Amazon, CD Baby, and all the digital download outlets such as iTunes, eMusic, Rhapsody, and others. In 2003, you established, Blue Canoe Records, the first digital independent jazz label. What led to forming this business, and what kind of artists does the label seek? When we recorded the first E.M.P. Project CD in late 2001, we shopped the CD to labels until we had exhausted just about every outlet and contact that we had. I sent an e-mail to former Weather Report drummer Peter Erskine for guidance. Peter has his own label, and I thought he may offer some bit of advice. We received a very thoughtful e-mail about the state of the music business, and Peter advised us to start our own label. From his inspiration, motivation, and our contacts, I sought to take this idea and move forward. My first priority was to seek several partners that shared in my vision to help in this venture. I decided that we would take a radical departure from the traditional way of running a label by going "all digital," meaning that the music would be primarily only offered by downloading it. Lucky for us, this was a year before the iPod and iTunes store craze hit. At present, we have 8 artists, over 12 titles, and it's growing. Our next release is from drummer Jimmy "Junebug" Jackson who spent 21 years with the late, great Jimmy Smith. In fact, Jimmy Smith and guitarist Mark Whitfield appear on a track. Currently, Blue Canoe Records seeks artists primarily in the jazz vein. However, we are open to just about any progressive, adventurous-type recordings and artists. Now that Blue Canoe Records is up and running, my current role is more of an A&R scout and producer for the label. I've taken more of a backseat to the business duties so that I can concentrate on my own musical and touring opportunities. Using the internet and your studio, you can record bass parts for artists interested in featuring your playing on their own projects. How do your remote sessions work? The "remote session" was an idea that I got from Dave Weckl and drummer Phillip Smith. "Remote Sessions" is essentially a way to record over the internet. I'd been doing this for a few years, but recently I decided to take this mainstream and offer this service from my web site store. Basically, it works like this. The artist/producer would send the tracks to me to record on via the internet using FTP or a CD-ROM delivered by mail. I would import the tracks in my studio, record the bass part, send an MP3 reference, and then ultimately send a high resolution digital or physical track for the artist or producer to import into their session. Which interactive, online courses do you teach at MusicDojo? I'm currently teaching two levels of "how to read music" for bass, guitar, and general instruments which run every six weeks. Both levels of these courses are designed especially for the desired instrument. In the "Reading 1 Class," we start as if you have never experienced notated music before, and by "Level 2," we work our way up to very advanced and technical reading exercises. For a complete breakdown of the material covered during those courses, I would recommend visiting the MusicDojo website and checking out the class outline that is posted there. MusicDojo is a great outlet to study music from any part of the globe via the world wide web. Do you offer private instruction? I do offer a limited number of private lessons in the Atlanta area. If someone is interested in setting up some lessons, they could just e-mail me, and we would take it from there. Is most of your time devoted to performing with your own group or within the context of a sideman in other ensembles? It's about 50/50 leader/sideman. In the future, I'm more interested in focusing on my music exclusively. However, that being said, there are certain artists that I want to work with, and I'll always keep all options on the table. Can you discuss the advantages that you have experienced in being able to play both electric and acoustic upright basses? By playing both the double and electric bass, it has provided opportunities for me to work and meet many exceptional people and artists in the industry that I otherwise never would have met if I just played one type of bass. I do play the electric/fretless and upright about the same amount. However, on the road, it's much harder to keep the upright together due to a limitation of space and practice privacy. With a pair of headphones and a very limited amount of space, you can practice the electric all day long. Who has influenced your musical direction? My early influences included my band director's Chet Hedgecoth, John Abel, and my bass instructor, Rusty Holloway, while I attended the University of Tennessee at Knoxville. In addition to learning from my personal mentors, I started studying and learning from records and cassettes of Miles Davis, The Police, Led Zeppelin, James Jamerson, Charlie Parker, Metallica, Stanley Clarke, Marcus Miller, Herbie Hancock, Jimi Hendrix, and Jaco Pastorius to name a few. These artists were and still are a huge inspiration and motivation for me. What kind of projects do you have lined up for 2006? I'm currently finishing a CD titled Decade 1996-2005. This CD contains selected tracks taken from each of my CDs recorded during this period. In addition, I've recorded a few new tunes. Plus, the entire CD has been remixed and remastered. I'm also completing an iTunes-exclusive CD titled Pause. Along with these two projects, I'm producing several other recordings for Blue Canoe Records.